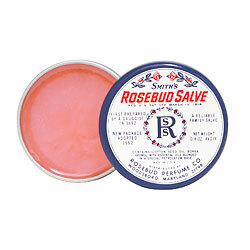 If you like lip balm, chances are you've heard of Smith's Rosebud Salve. But for all the amazing things people have told you about it, you still might not have tried it. Would it shock you to discover that this beauty chick just bought and tried it for the first time in the last week -- even though I've been told time and time again that owning it would change my life? For some reason, I just kept putting off buying the little tin filled with the stuff, which can be used to cure everything from chapped lips to cracked heels and ashy elbows. But luckily, it was in the bins next to the checkout line at Sephora last week ... and that meant I just had to pick one up. As I unscrewed the tin, I wondered whether I would become as addicted to the balm as everyone claims is bound to happen. "No way," I thought to myself. "I'm sure it will be nice, but come on -- it can't be that good." Well, I was completely and utterly wrong! First of all, the deep pink hue of the balm is just so pretty -- it makes me want to dive right in and scoop out a bunch to smear all over my lips! The slightest rose aroma wafts out of the tin when it's opened, and as roses are my favorite flowers, I definitely am in love with that! The texture of the petroleum-based balm is wonderful -- not at all sticky or tacky, and it leaves a beautiful glossy sheen on the lips. And the staying power is amazing. I rubbed a bit on my pout before bed one night, and I'll be darned if it wasn't still soft and smooth with salve the next morning! I've taken to carrying the tin around in my purse -- it's as important to me as my wallet or my phone! All in all, this is one product that it's safe to say will not stray too far from my side. Smith's Rosebud Salve retails for $6 at sephora.com. I have the Rosebud Strawberry Lip Balm & Moisturizer and like you, it took me forever to try these products out. I must say that I like it and now must try the original! I love Smith's Rosebud Salve, too! I first bought it in Taiwan, and after smoothing some on my lips, I instantly realized it was a must-have for me, too. I love the staying power, too--it lasts all the way from morning to lunch, even when I'm walking all over the city with winds and sun. And the natural sheen is very natural and pretty! The only thing I have to say is . . . bad hygiene! It's a dirty practice to use lip pots, since it requires the use of 'finger to mouth'! And can we all say we ALWAYS wash our hands before using these lip pots? Keep up the bloggin, love reading your posts!